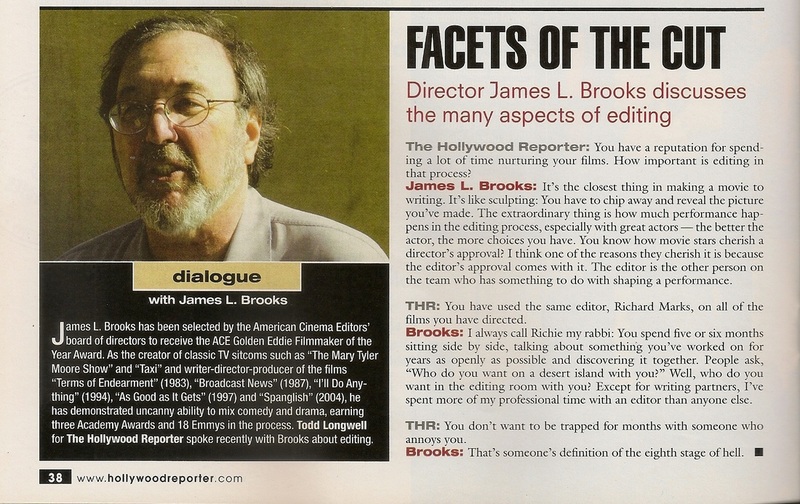 _Below is the balance of my Jan. 2005 interview with Brooks, previously unpublished. You're one of the only filmmakers who has used editing as a major plot point. You mean in “Broadcast News.” Yeah. That’s fun. How’s it feel to get honored by an editing society? Everything you do before you edit a picture is to give you the raw material… is to feed the editing process. Everything you do, when you write it, when you think of it, when you want to make, when you cast it, when you do another take, when you do your shot list, when you storyboard, everything is about giving yourself the raw material to edit a movie. Everything. And the extraordinary thing is how, especially with great actors, how much performance happens in the editing process. The better the actor, the more choices you have, and you have varying performances you can give. And tone happens in editing. We’ve had things where we’ve gone through previews where it’s like fishing, where you’re chasing the laugh in the editing process. You don’t get it at one preview, and as you start to edit it, just to play that moment. And you know whether you’ve gotten it, because you know whether you get a laugh at the next preview. That part’s like fishing. Storytelling happens most completely in the editing. It has to be there in the script, but it really happens in the editing process. And the spirit is a controllable number of people. So the spirit of it is great. You know how movie stars cherish a director’s approval. I think one of the reasons they cherish it is because the editor’s approval comes with it. The editor is the other person on the team who has something to do with shaping a performance. The stories are legion about what the great editing touches were at the end of the road. The amazing thing is, you’re editing the picture, but you’re making the picture. It’s all about making the movie. Can you think of a particular scene where editing saved it? It’s just that some have been more difficult than you could imagine. The sweating scene in “Broadcast News” was for some reason incredibly hard. We spent more time editing that than any other scene. You can never predict what will turn out to be difficult in the end. Was it making space for the laughs? No. It was getting the laughs. To crack that scene so it played funny was, for reasons I don’t remember. But I can’t tell you… More man hours went into that scene than almost anything I’ve ever done. Sometimes it’s finding a shot and just going over it, especially in those days. That was a surprise. Jokes based on timing being everything, well, timing is the editing process. I think it is where it happens. Everybody knows that you can come out being thrilled by dailies and just flying, and then that it’s never in the picture. Context is everything, and you create the context in the editing room. The superstition is the great dailies make for a bad finished film, which I can’t believe is true. The point that’s trying to make is true, the phrase isn’t. Terrible dailies make for a terrible film.